Buyers choice - turnkey home can be sold fully furnished or unfurnished! One of the largest only townhomes at The Enclave with a 4th floor LOFT! 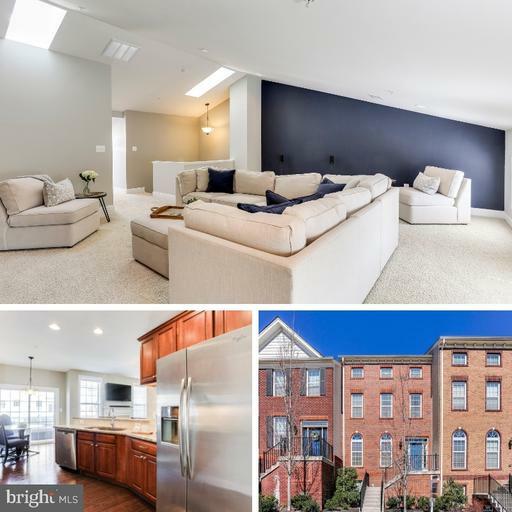 Original owners have upgraded this home from top to bottom including the addition of a spacious loft, lower level recreation/theater room, and 4 full bathrooms! This 4 level brick front home includes 3 large bedrooms, 4.5 baths, and 2 car garage! Main level comes with expresso hardwood floors, family room with gas fireplace, and large Trex deck. Gourmet eat-in kitchen includes double ovens, stainless steel appliances, granite countertops, and upgraded cabinets. The master suite has an en-suite spa shower with rain shower head and two closets including a walk in closet!. The flexible loft space has its own full bathroom, reading nook, vaulted ceilings, skylights -- perfect as an in-law suite, guest suite, 4th bedroom, or recreation room! The lower level theater room is equipped with the Bose surround sound system 65" TV both convey, and another full bathroom! This smart home also comes with Nest Thermostats Lift Master Garage opener. Community amenities include pools, fitness center, meeting rooms, clubhouse, walking trails, plenty of guest parking more! Minutes from the regions largest shopping center Arundel Mills, MD295, I95, BWI Airport, MARC train, Fort Meade NSA, dining, entertainment!